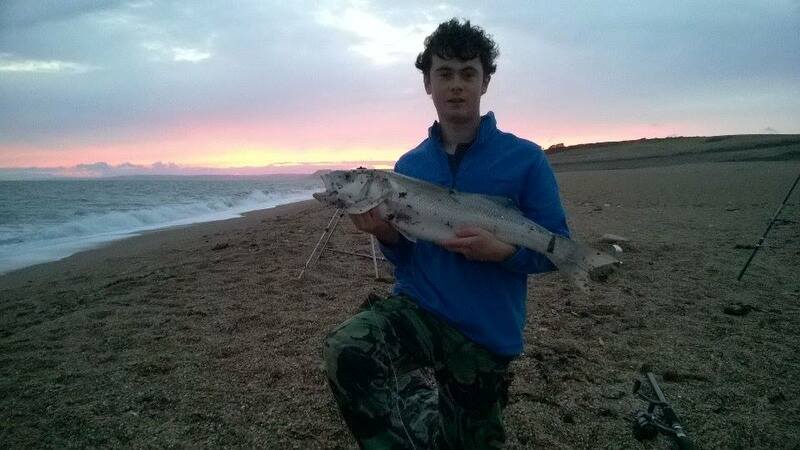 When is the best time to fish Chesil Beach? Right now! is the answer. I can’t remember ever seeing so many anglers on Chesil as there was on Friday and saturday. From Chesil Cove to as far as I could see, there were anglers all along the beach. Is this the start of the Cod season? I don’t think so! There have been a lot of Codling all year long and the rough weather brought them in for a feast. I think we will need to wait a few more weeks before it kicks off properly. There were huge shoals of Mackerel running up and down the length of the beach. They were pushing bait fish right onto the beach, and they in turn were being chased by Bass. It was an amazing site. Following the Mackerel shoals were Garfish and Mullet, feeding on the thousands of dead baitfish left floating on the surface. The Mullet were so close you could almost touch them. The fish were in so close I even managed to catch Mackerel on my fly rod. It is such a fun way to catch them. Friday evening produced some great results as the water still had a bit of colour in it from the rough weather a few days earlier. This meant that there was loads of Cod and Bass to be caught on the beach. 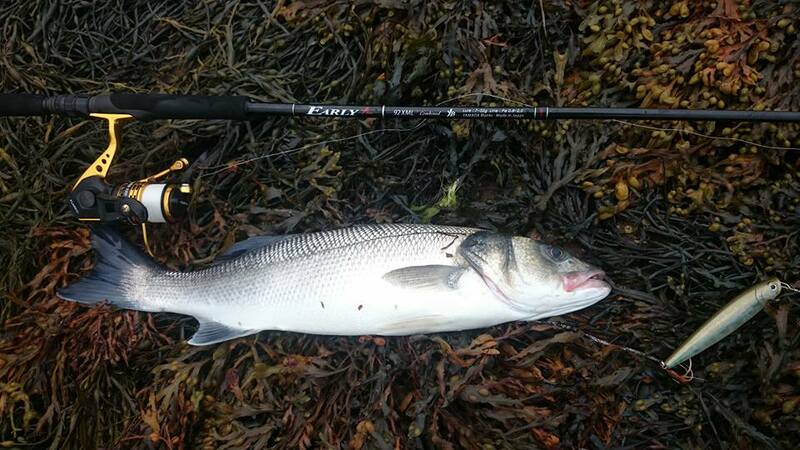 Bradley Price managed a few Cod and a nice Bass around the 5lb mark. Al Jones went out to try and catch his first Bass ever. I guess 10lb 1oz. is a good way to get the ball rolling. I am not jealous in the least! Chesil Beach forecast: The wind for most of the week looks like it will be North Easterly. This is a good wind for Chesil if you want to try and target everything except Bass and Cod. The sea state will be calm, and with the wind coming over your right shoulder, you should be able to cast a good distance. Essential if you are after the numerous Plaice that are down the western end of the beach. Cogden and West Bexington seem to be fishing well for Plaice and a few Sole. Bream, Gurnard and Smoothound should be on the cards from the Weymouth and Portland end of Chesil. I expect the Mackerel shoals to be around all week. 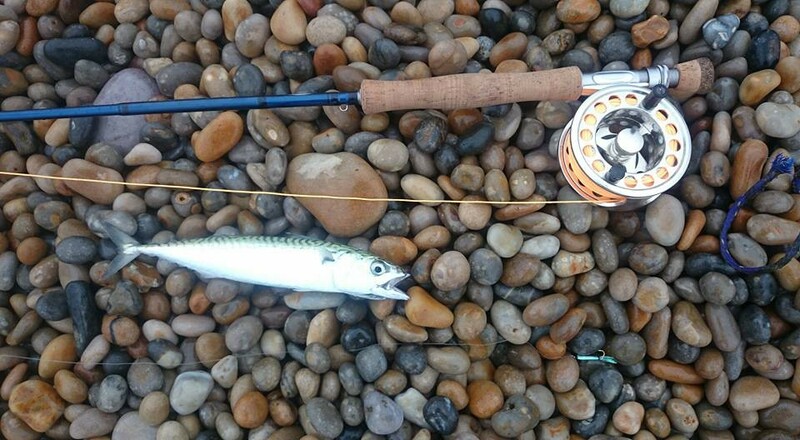 Having seen hundreds of Mackerel heads all along the shoreline, you have to think about using one as a bait, fished close in. Big Bass and after dark, large Rays will come very close to feed on the Mackerel heads. It is essential that you don’t shine your headlight on the water, as this will spook the fish. 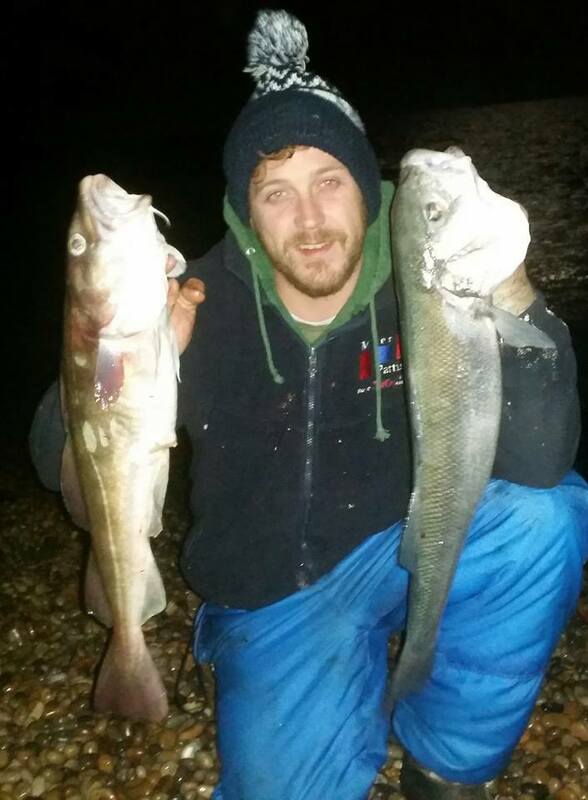 Scad are around at dusk and can easily be caught on float fished Mackerel strips. As can Garfish. You can also pick them both up on small lures. Portland: I expect to see Pollock in good numbers now that the water is clearing around Portland. September is a great month for Pollock and Wrasse around the Island. I love to fish Church Ope Cove as it starts to get dark. Sport can be hectic in that last hour of daylight. I prefer to use lures or float fished Mackerel strips. Portland Harbour: I have had a lot of success in the harbour over the past 3 days. In several short sessions of little more than an hour at a time, I have managed to land 28 Bass. Everyday they seem to be getting bigger, and as the month progresses, I hope to see some much bigger fish. Every Bass has come on surface lures. Seaspin Pro-Q 120, Gunfish and Patchinko II have been my most successful lures so far. Weymouth Bay: As the fishing has been so good everywhere else, I have not had a chance to visit Weymouth, to see how the fishing has been there. I have heard a few reports that the piers are fishing very well. Lots of different species have been landed including Gurnard, Wrasse, Pollock, Pout, small Bream, Mackerel and Garfish. Due to a large number of requests I have freed up a number of additional dates for shore based guiding in the coming 3 months. August to November are by far the best months for fishing, and are normally my busiest times. I will be offering lure and bait fishing for a whole range of species including Bass, Pollock, Rays, Bream, Trigger Fish and Codling. 2 Responses to "The best week of fishing this year"
I spent 3 hours over the w/e around Sandsfoot with surface lures and not a single fish! Wrong place, wrong lures, wrong technique?! Most likely the wrong time and possibly the wrong technique Trevor. I teach a number of different ways to fish surface lures, that work really well in different conditions. The harbour is a great place to fish, but you need to be mobile and move to different areas at different states of the tide.